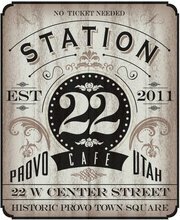 On Thursday, we’ll be doing a bike-friendly-business ride to visit Station 22 in downtown Provo (see event guide). But, you don’t have to wait to get a good deal on soups, salads, and sandwiches. Station 22 has generously offered a 20% discount to anyone that shows up on a bicycle all week long. Just let them know you came on two wheels. Provo cyclists and businesses have been working together for a long time. Cyclists are loyal customers to local businesses, and businesses realize that bike infrastructure in Provo helps draw in more customers. By making it safe and easy for families to ride their bikes downtown, Provo helps our local economy thrive. Thanks, Station 22, for being bike-friendly! This entry was posted in Bike-Friendly Business by Jamie. Bookmark the permalink.